The flap that covers the tank cap is unlocked and locked automatically by the central locking. – Press the left side of the flap to open it ⇒ fig. 247 -arrow-. – Unscrew the tank cap anti-clockwise. – Hook the cap onto the open flap ⇒ fig. 248. – Screw on the tank cap clockwise until it cannot be turned further. – Press the left side of the flap to close it (you should hear it click into place). When the automatic filler nozzle is operated correctly it will switch itself off as soon as the tank is “full”. Do not try to put in more fuel after the nozzle cuts out, as this will fill the expansion chamber in the fuel tank. 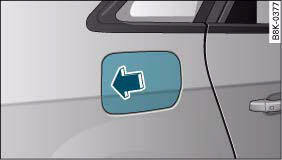 The correct fuel grade for your vehicle is given on a sticker on the inside of the tank flap. Further notes on fuel. The tank capacity of your vehicle is given in the Technical data sectiongggggg 321. Fuel is highly inflammable and can cause serious burns and other injuries. 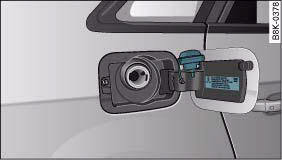 • For safety reasons always switch off the auxiliary heating* before refuelling the vehicle. • For safety reasons we do not recommend carrying a spare fuel canister in the vehicle. The canister could become damaged in an accident and leak. • Observe all relevant statutory regulations on using, storing and transporting spare fuel canisters. • When filling your tank or a spare fuel canister with fuel, do not smoke and keep away from naked flames. Risk of explosion! − Never fill fuel into the spare fuel canister with the canister placed in or on top of the vehicle. An electrostatic charge could build up during filling, causing the fuel vapour to ignite. Danger of explosion. Always place the canister on the ground to fill it. − Insert the filler nozzle as far as possible into the spare fuel canister. − If the spare fuel canister is made of metal, the filler nozzle must be in contact with the canister during filling. This helps prevent an electrostatic charge building up. − Make sure you never spill fuel in the vehicle or in the luggage compartment. Fuel vapour is explosive. Risk of fatal accident! • If any fuel is spilt onto the vehicle, it should be removed immediately, as it could otherwise damage the paintwork. • Never run the tank completely dry. If there is an irregular fuel supply, misfiring can occur. As a result unburnt fuel can enter the exhaust system and cause damage to the catalytic converter(s). • When filling the fuel tank after having run it completely dry on a vehicle with a diesel engine the ignition must be switched on for at least 30 seconds without starting the engine. When you then start the engine it may take longer than normal (up to one minute) for the engine to start firing. This is because air needs to be bled from the fuel system while starting. The tank flap is not locked when you lock the vehicle from the inside. 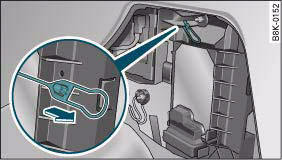 The tank flap can be released manually if the central locking system should fail to operate. The manual release mechanism is located behind the side trim on the right of the luggage compartment. – Open the right-hand side trim. – Release the ring from its holder and pull the ring ⇒ fig. 249. You should now be able to open the tank flap in the usual way.